The PhenoMeNal consortium is pleased to announce its next round of usability study of its Cloud Research Environment Portal. 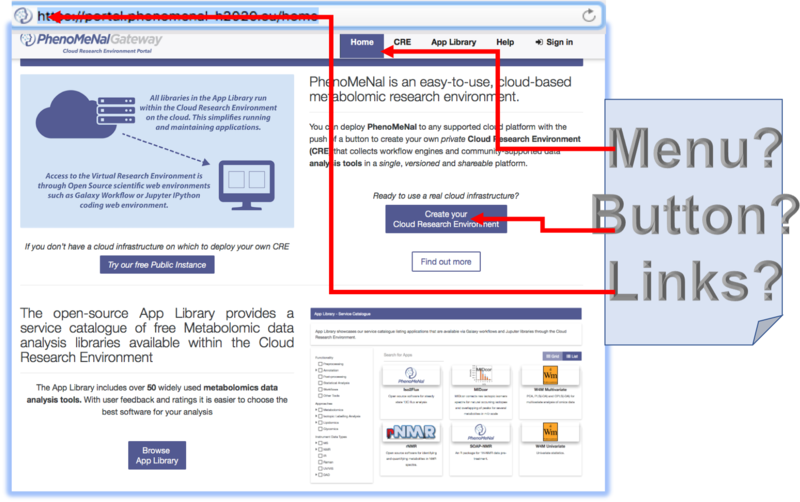 The PhenoMeNal Gateway/ Cloud Research Portal is the entry point to an array of useful metabolomics applications, all available through a user-friendly, standard scientific open-source web environments. We use open-source tools and methods, and provide a cloud-based, scalable, privacy-compliant infrastructure for metabolomics research. Our sole intent and goal for this study is to assess the usability of the prototype of our portal! If you are a metabolomics researcher with interest(s) in data analysis, you might be the key user we are trying to target. You do not need to prepare anything in advance. To take part all you need is a computer with webcam and a headset. The sessions will be conducted by our expert UX consultant, Paula de Matos. The information gathered from your participation will help in understanding the user requirements for this project. No information will be circulated that would make it possible to identify any particular individual’s views. If this sounds interesting and you can spare some of your precious time, please click here (Registration Closed).